Today we celebrate the Feast of the Holy Family of Jesus, Mary, and Joseph. Cherish the precious gems you have in your family: siblings, spouse and sons/daughters; recognize the gems in your parents. Notice the gems all around you in your neighborhood and parish community. We become like God, here and now, by striving to reflect godlike attitudes and behaviors in our relationships with one another. In the Gospel according to Luke, the family of Jesus, Mary, and Joseph made a pilgrimage to the temple in Jerusalem. On their way back, Mary and Joseph suddenly realized Jesus was missing. But their anxiety turned into joy: young Jesus was astonishing the rabbis with his wisdom. This close-knit holy family went back home to Nazareth, where Jesus grew in wisdom and age. For twenty-some years, this family clung together. They fled to Egypt together. They lived in a backwater village and worked at ordinary tasks. Joseph, tradition says, kept his loved ones in daily bread with the skill of his hands. Mary baked and spun, carried water, and taught Jesus to pray. And Mary eventually waved goodbye to Jesus as he set off for his life’s mission. She experienced the empty nest! 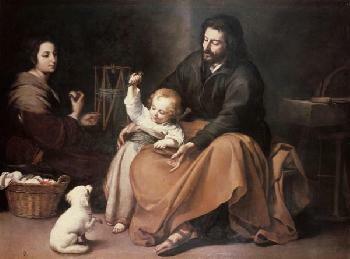 What sustained the holy family in Nazareth? What sustains ours? I would like to suggest three virtues: faithfulness, courage, and prudence. Faithfulness builds trust. Parents need to be faithful to each other and to their children. Children trust that parents will always be there. We all need to know that someone loves us and will always be there for us, especially when we hit a rough patch in life. We need the anchor of faithfulness in our ever-changing world. Second, families need courage. Courage is about moral character. It defines who we are at the core of our innermost selves. It is an attitude that challenges us, despite our fears, to stand up for what is right and true and good. Many of us would include Gandhi, Martin Luther King Jr, and Mother Teresa in our list of courageous people. And we probably would include our parents. Parenting, sustaining life, requires courage, always trying to do the right thing even when we’re not sure it’s right. And the third virtue for families is prudence. It doesn’t mean caution. Rather prudence is the instinct to seek the right thing to do among our many choices, whereas courage is the instinct to do the right thing despite our fears. Prudence and courage go hand in hand. Often decisions are not either/or but both/and. It’s only by making decisions daily that parents become experienced decision makers. Prudence requires continually reflecting on decisions and learning from them. Jesus, Mary, and Joseph lived as a family, a holy family. May God on this Feast of the Holy Family anchor our own families and community in faithfulness, courage, and prudence.